"In implementing the 'road map', UNDP is submitting for consideration by the Board a package of proposed measures for the resumprion [sic] of UNDP programmes in DPRK, including a request for UNDP to approve assistance to DPRK on a project-byproject basis until the end of 2010. The document outlines the programme interventions to be supported by UNDP, as well as a tentative agreement reached with DPRK on operational modalities that will be used – in particular in the areas of programme implementation, human resources and finance... Proposed measures for the resumption of programme operations in the Democratic People's Republic of Korea (DP/2009/8)." But unlike the other country programs listed in DP/2009/L.1, UNDP's above-described North Korea document was not put online. "On your first question, there is nothing to deny or confirm. 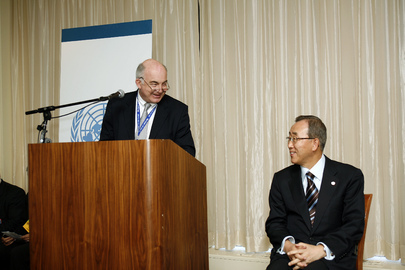 You, like anyone else, can access the documentation being posted on the UNDP.org website in advance of the Exec Board. The document you refer to is, as of a few minutes when I checked, not yet posted. It will be in due time." While at odds with the UN system's repeated promises of transparency, this is consistent with previous UNDP secrecy. UNDP's Dervis looks down on UN's Ban: whose transparency promises will out? After the last Executive Board meeting, at which UNDP's Asia and Pacific chief Ajay Chhibber read out a statement on North Korea, Inner City Press asked Dujarric for a copy of the statement. You can order an audio tape of the meeting and transcribe it, Dujarric said. Inner City Press told him what UN staff revealed: the meeting was not taped, having been characterized as closed or informal consultations. And so UNDP's impulse to secrecy continues. Please describe UNDP's involvement in the past 3 years in currency exchange in Zimbabwe, whether the rates given were determined by the Reserve Bank of Zimbabwe / government, how this compared to other rates available, in light of John Holmes (and Ms. Braggs') recent comments that there have been currency exchange issues / losses in Zimbabwe. Any awareness you or UNDP have of inquiries into irregularities in Afghanistan procurement and construction, by UNOPS or UNDP, including but not limited to the use of Italian funds for a hospital. How much rent to UNDP pay to Nigeria for space in Nigeria House in NYC, and how was it determined? What has UNDP done, and what is it done, in the Niger Delta? The incident occurred last week as Igballe Rogova, Executive Director of the Kosova Women's Network (KWN), was preparing to speak at a UN conference on women and governance in Istanbul. UNDP organizers told her that her speech was "too political" and that she could only speak if she removed all references to the plan from her remarks. In an angry statement sent to UNDP headquarters, KWN accuses the agency of suppressing freedom of speech and undermining democracy. 'Evidently the UNDP organizers believed that women are allowed to participate in politics only so long as they are not too political or they avoid serious political issues,' it reads. That sure sounds like UNDP. But where are UNDP's responses?